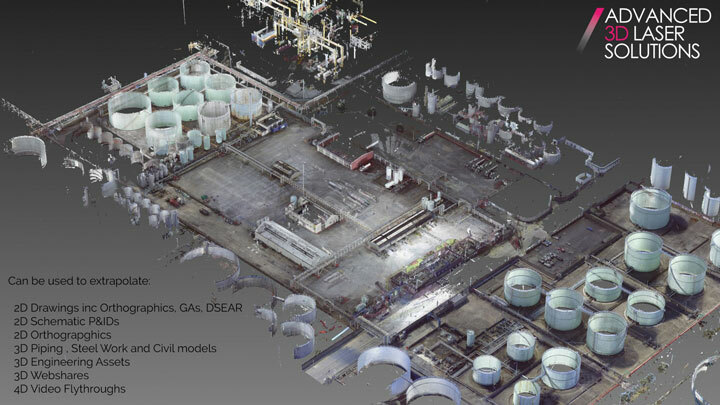 Advanced 3D Laser Solutions (ALS) recently completed the 3D scanning of a European oil storage depot with fantastic results, which I will talk about later. The survey was completed using three FARO Focus 3D laser scanners, 24 Reference spheres, three heavy duty tripods and three of our finest surveyors. ALS captured over 460 high resolution 3D Laser scans during the 4 days we were on site. Initially ALS are to 3D model pipework systems only. However the vast amount of site data collected beyond pipes with our laser scanners represents what would require years to achieve using traditional surveying methods. And of course the data collected is free from the potential for human errors reasonably expected with traditional methods. The client will now be in possession of an accurate site record, the information able to be shared across the organisation, with the ability to gather measurable site information without leaving their offices, accurate to +/-2mm. Our 3D laser surveyors are from an oil & gas background, giving ALS the experience in not only the understanding of exactly what should be captured in the scans, but also awareness from working on a fuels terminal. Our scanning on DSEAR sites is controlled with a ‘hot work’ permit system, our surveyors constantly monitoring the working environment using personal and sometimes area gas detectors. Even before we arrive on site, detailed risk assessments and method statements examining the potential risks in working on this type of site are considered. This being especially important whilst working on road loading racks were terminal operations need to be maintained with minimal disruption to client. So what was the reason for the survey? Initially to model pipework ahead of API 570 inspection program, with options to complete ‘in-service’ tank analysis to determine future API 653 maintenance requirements. Ongoing the client now has a complete site file that can be used as a basis for new capital investments and in producing 4D training videos. With the wide diversity of uses including bund volume analysis, client priorities will determine next use of the file. We are able to create, highly accurate 3D models of the site, including pipework, steelwork, civil and ground data. This can be used to create API570 / NDT isometrics or orthographics; at a fraction of the cost and time it would traditionally. Using either the 3D model or webshare clients are able to produce asset / document management systems from the data created by the 3D survey. The requirement to add or remove equipment on site, can become difficult with the population of existing, pipework, equipment, steelwork, bund walls and ground work. After a 3D scan of your site we have all of this information, using specialist software we are able to manoeuvre new / old equipment in or out of position and determine possible clash areas. Saving time, money and risks for the client. Using the 3D point cloud data, we are able to produce high resolution (including 4K) rendered video files, which have become increasingly popular with our clients, for various needs including health and safety / induction videos and marketing. Even in our modern 3D world, there will always be a place for 2D drawings; especially in petrochemical and that is why at ALS we have not lost our expertise in this. We still have a number of clients, which still require us to manually survey their sites for P&ID schematics. But this is not to say it can’t be done with 3D scanning technology. Our services will save you time and money allowing your budgets to stretch further, please feel free to contact us to discuss this technology further.